Throughout the 2018-2019 academic year, DIS has been celebrating the beautiful and diverse country of South Africa. With gala night swiftly approaching, who better to share more about this important nation and all it has to offer the world than members of our own DIS family who hail from South Africa? 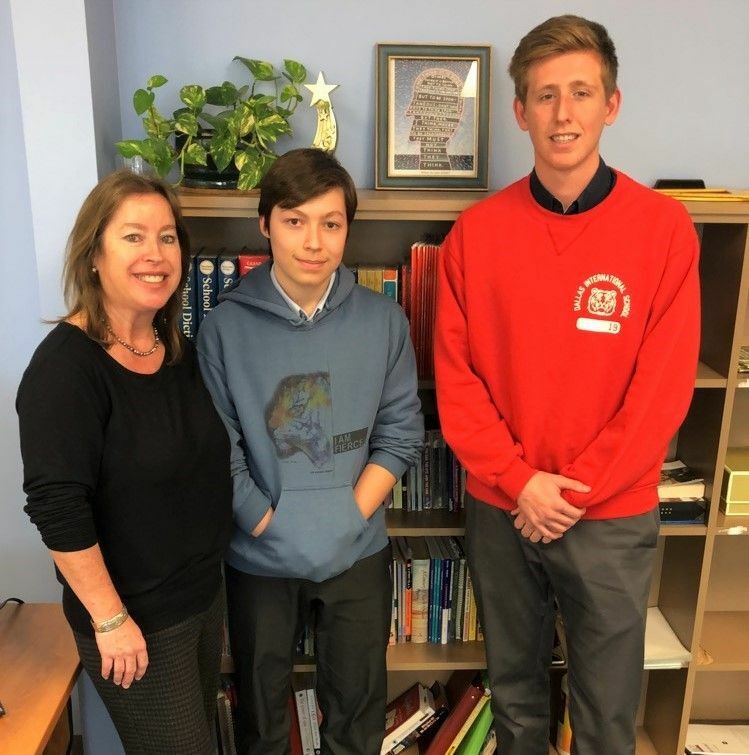 DIS middle and high school English teacher since 2000, Patricia de Villiers, Patricia's son and 10th grade student Etienne, and 12th grader, Remy Le Meistre, all took some time to share their thoughts and feelings on their homeland and what this year's Country of the Year selection has meant to them. Remy, born in Johannesburg and coming to the States in the 10th grade when he was 15, Patricia, whose family still resides in the country, was born in Cape Town and moved to the US in 2000, and her son Etienne, born here but traveling to South Africa often, all shared in unison that South Africa is definitely a melting pot, when asked what they would share with outsiders about their native soil. A conglomerate of peoples, foods, traditions and languages (South Africa has 11 official languages) from all over the continent of Africa and elsewhere, South Africa retains its identity while still celebrating all the influences of the ethnic groups that make it up. "People will go on for hours talking about their backgrounds, because everyone has a story to tell and everyone comes from somewhere different," affirms Patricia. This is apparent solely from speaking with these three, as young Etienne speaks, English, French, Spanish and Afrikaans, Patricia speaks English, French and Afrikaans, and Remy speaks multiple languages, including French, Spanish, Afrikaans, English and some Portuguese. Over the course of the conversation about all the things that are near to their hearts about their motherland, the things everyone seemed to miss most were the people, the natural beauty, as the country has ample mountainous and borders both the Atlantic and Indian oceans, the food and the sports culture of the country. From biltong, boerewors, bobotie and chakalaka, to some of the finest wines and freshest seafood in the world, Patricia insists that South African food is absolutely amazing. Etienne and Remy shared their fondness for all things sports, including cricket, soccer, hockey, water polo, and most importantly, rugby, which Remy started playing at a young age and does still to this day, on a team here in Dallas. An incredibly impactful moment in Patricia's life was the 1995 Rugby World Cup, held in South Africa. It was the first major sporting event to take place in the country following the end of apartheid, and was attended by previously freed from prison and newly elected president, Nelson Mandela, wearing a Springboks rugby shirt and cap. The South African team would go on to win the Rugby World Cup that year, which would later be reenacted on the big screen in the movie, Invictus, with Morgan Freeman and Matt Damon. When asked what it meant to her and how she felt when South Africa was named DIS's Country of the Year for 2018-2019, Patricia confirmed that she was extremely elated and while she didn't try to sway any faculty to vote for it, when she heard the announcement, it warmed her heart to see her country win for the academic year. "I was so excited, because there's so much that people don't know about South Africa," explained Patricia. With the current projects and activities going on throughout the school and in each classroom, and the upcoming gala, we hope this will open minds on everything this truly great nation has to offer.